Workers at Pradeep Laminators restarted their strike action on 27 December 2013 after negotiations with the company broke down. 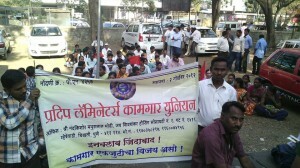 Earlier last year, in June, workers protested against the management’s refusal to enter into negotiations with the union (See: Solidarity Appeal: Workers’ Agitation in Pune). After the protest, management assured them that they would begin the process, but then resorted to dirty tricks by unduly dragging out the negotiations so they led nowhere. The management is continuously attacking the rights of workers by suspending many of them, slapping pay cuts on others, or even to the extent of using muscle power to try to break the union. The union was formed in 2012. While repression in the workplaces is nothing new to capitalism, the bosses on this industrial estate have been using ‘goons’ (hired thugs or lackeys) to intimidate not only the workers but local villagers as well. It was against this backdrop that the workers at Pradeep Laminators, guided by senior left activists and trade unionist Adv. Vaishali Sareen (Lok Chetana Manch) took the audacious step of forming their own independent union on 15th August 2012. The management adopted a harsh stance towards this new union. When the previous contractual agreement with the workers expired, on 1 January 2013, the newly established trade union put forward a list of demands, including a pay hike and a request that management begins the process of negotiating a new contract. Since then, management has used all manner of dirty tactics to suppress the union. Even after working for 15 years continuously, workers earn near-poverty wages and many have to work for a minimum of 12 hours a day to achieve this! Workers have setup small tent near the company gate and have been doing a sit-in protest after finishing their shift. More than 40 workers are participating in the sit-in and, despite pleas to management and government offices, nothing has moved so far. But workers are refusing to give up and are taking the struggle further audaciously. • Management has been witch-hunting workers and as a consequence, seven have faced judicial actions in the Industrial Labor Court over the past two years. 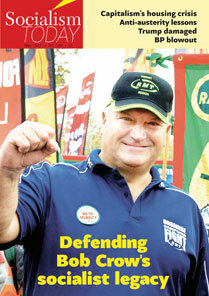 • Workers have been fighting from 2010 for a pay rise. Out of 87 workers as many as 50 are getting a salary of a mere Rs7,122, a near-poverty wage – after working for around 15 years for the company. They have not even got a single rupee pay hike in recent years while inflation has been consistently at 10% or higher for the past five years. • The company started in 1994 with 230 workers. Today it has 184, out of which 87 are permanent while the others are illegally employed on contracts. • Though the previous agreement expired on 31 December 2012, management has refused to enter into meaningful negotiations. • Contract workers toil for 12 to 16 hours a day on machines. • The company opened a new factory in October 2010 named Pradeep Polyfex. The owner of the company has been shifting the work from Pradeep Laminators to Pradeep Polyfex and threatening: “No work, no pay”. The work at this new factory is being carried out by contract workers in a blatant violation of contract laws. • The company even forbids workers from taking the holidays they are entitled to. If anyone wants a holiday, he has to arrange for a replacement. • Blatant violation of security norms continues and there is no medical van in case of any industrial accident. • The company doesn’t even have a canteen facility. • Bosses liberally use muscle power by hiring local goons to intimidate workers. So far, three workers have been assaulted. A letter of demands was given to the company authorities as early as 1 January 2013 includes following demands. • Management must start fair and meaningful negotiations on all demands, including a pay rise without any further delay. • Illegal pay cuts slapped on the workers must be revoked and workers be paid due arrears. • Sacked female workers must be re-employed. • Complete stoppage of illegal transfers of work to Pradeep Polyfex. • ‘Permanent workers for permanent work’. Employ permanent workers at Pradeep Polyfex in accordance with the law. For more on the Pradeep Laminators Worker’s Struggle, please log on to their facebook page. Please send your support and solidarity messages to Pradeep Laminators workers. Workers at Pradeep Laminators, Pune, India have decided to go on agitation once again after negotiations with the company have failed. Earlier, six months ago, workers went on agitation in protest against the management refusing to enter into negotiations with the union. After the protest, management promised to begin the process and did so, but they were only to resort to dirty tactics of unduly dragging the negotiations to nowhere. The management is continuously attacking the rights of workers by suspending a few of them at a time, slapping pay cuts on others or even to the extent of using physical attacks to break down the union. 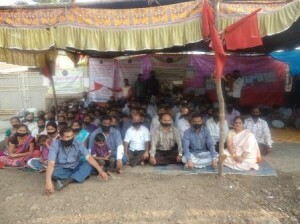 New Socialist Alternative in Pune has a close association with the workers of this factory who are requesting our help to mobilise worldwide support. Firstly they wish you to register your protest by writing a letter of condemnation to the company. The letter should denounce the brutal treatment and disguised agendas of the company and call for an immediate action and fair negotiations. You can do this by emailing at – pradeeplaminators@pradeeplaminators.com. Please come to the aid of these workers and help stop an aggressive firm from wiping out trade union rights in Pune!